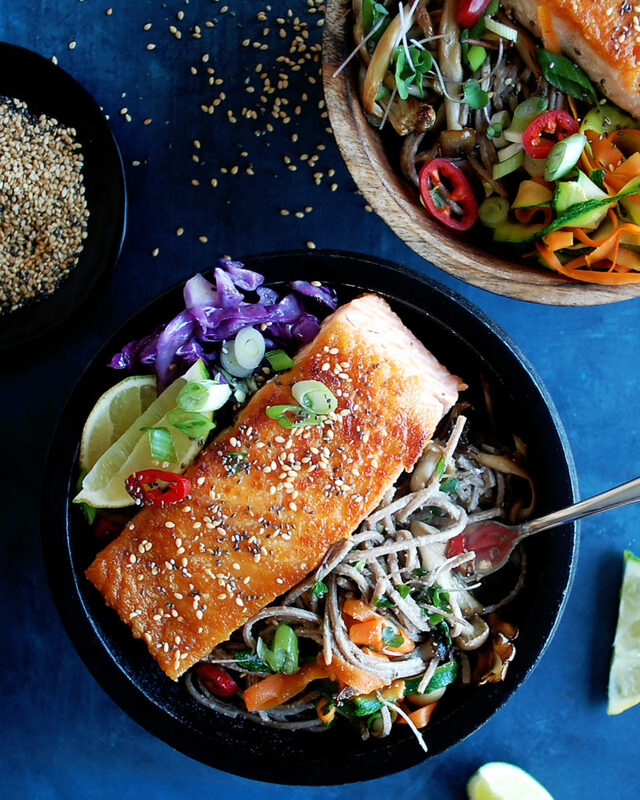 Healthy, delicious weekday meals that fit everything into one bowl are definitely the way to go. 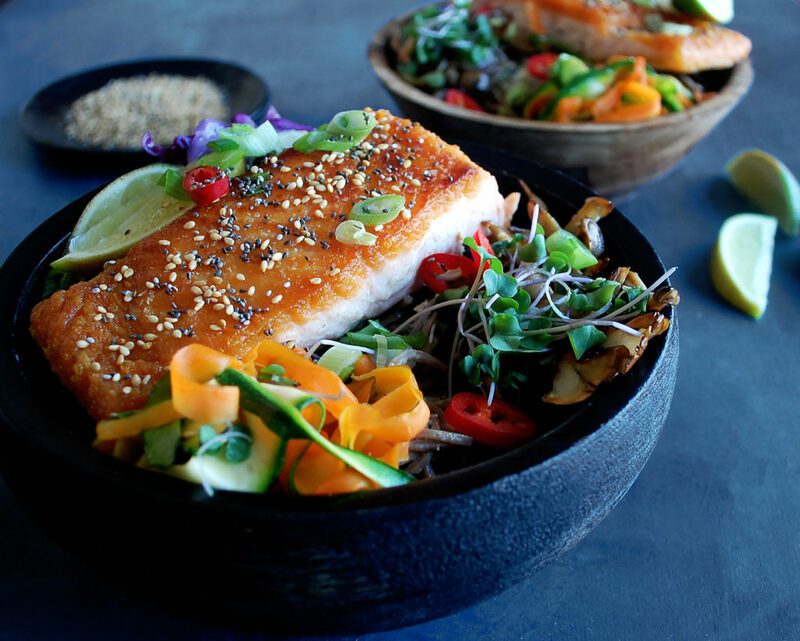 “Bowls” have become a huge trend in the food world, and for good reason. I love the idea of having all the different components of a meal (veggies, grain, protein, sauce, garnishes, etc.) in one bowl. Easily prepared. Easily eaten. And easily cleaned up. Plus, if you’re like me, you sometimes find yourself eating while running around working on other things, so a bowl transports perfectly. Or, in a better scenario, you’re cuddled up on the couch watching your favorite weeknight show, and for some reason, eating out of a bowl just seems so much better than scraping off a plate. And what’s even better about this bowl is that it’s packed with all the healthy things. 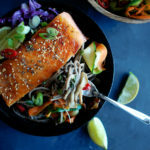 Lots of veggies, nutritious soba noodles, and fatty (the good kind), flaky salmon (I even sprinkle some chia seeds on top just for a little extra benefit). When you put the bowl together, you want all the flavors to blend so that when you get a bite with every component, it all works. 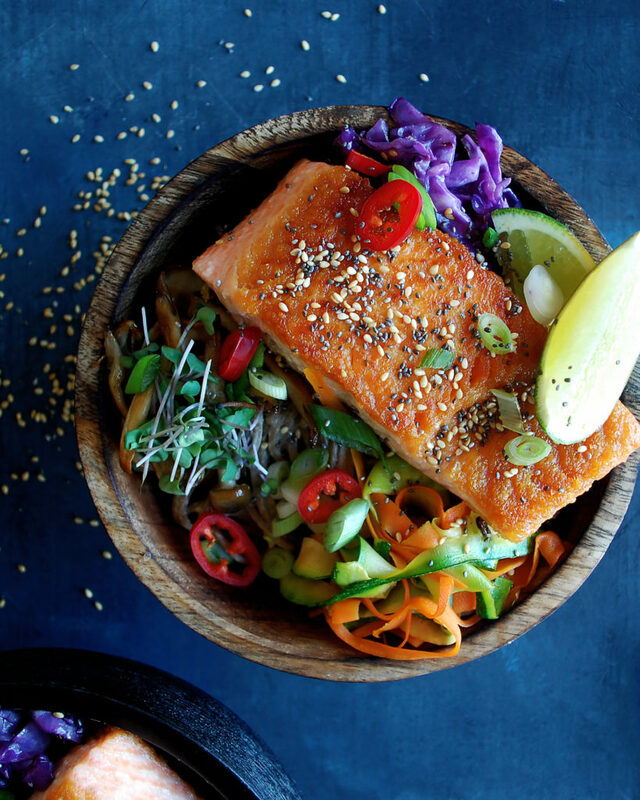 That’s why I keep the veggies and salmon simple, while adding all the flavor to the sauce for the noodles, and top the bowl with the perfect garnishes to bring everything together. I cook each vegetable separately, just simply in a sauté pan with some oil, salt, and pepper. That’s because each vegetable cooks at different rates, so I want each to have time to brown properly and cook all the way through. I usually do the zucchini and carrots together, just for a quick flash, and then follow it up with the mushrooms, which cook a little longer, and then the cabbage, which needs the most time. For the soba noodles, I toss them in a simple sauce that gets thrown together super quickly. It’s got sesame oil, rice wine, tahini, and a little honey for some sweetness. 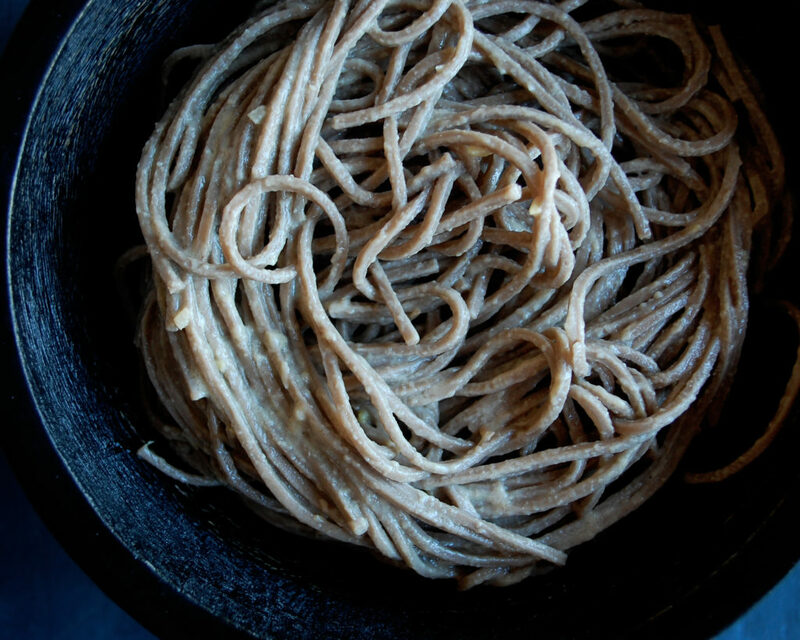 It’s simple, but has a slightly Asian flavor that works really well with the soba noodles. 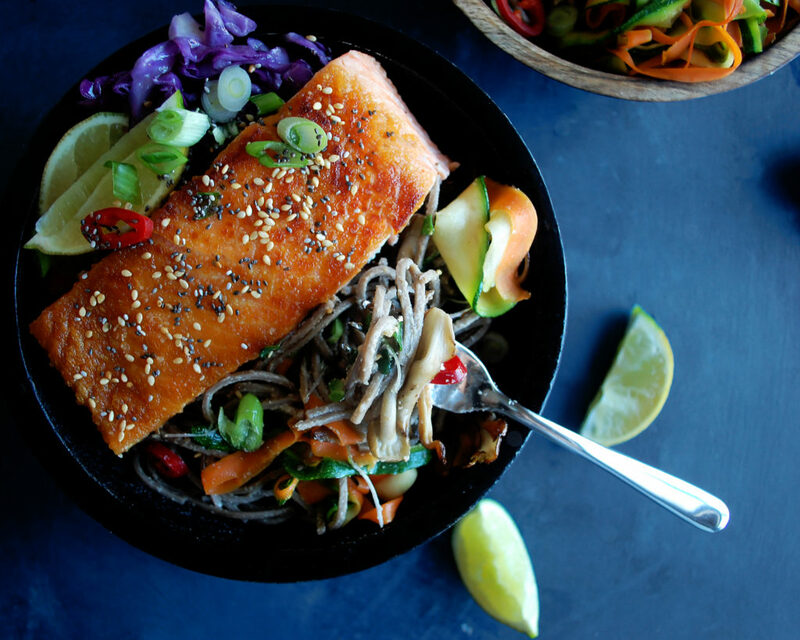 The salmon gets a quick sear and goes right on top of the noodles. And for my favorite part of the bowl…the garnishes. They make the bowl look good, while adding lots of crunch and flavor to the dish. I hope you enjoy! Use a peeler to peel the carrot and zucchini into thin strands. Thinly slice the cabbage. In a sauté pan, coat the bottom with safflower oil and heat over medium high heat. Individually sauté the carrot, zucchini, mushrooms, and red cabbage one by one. Cook each until they have a little bit of caramelized color and have softened. Season each with salt and pepper. Transfer each to a plate and keep warm. Meanwhile, cook the soba noodles in a large pot of boiling, salted water for 1 minute less than the package suggests. Drain the noodles and run them under cold water. In the pot, heat the sesame oil over medium heat. Add the garlic and ginger. Sauté for 30 seconds. Whisk in the rice wine vinegar, tahini, honey, and lime juice. Continue to whisk as the sauce simmers and reduces slightly. Add the noodles back into the pot and toss to coat. Meanwhile, season each filet of salmon with salt and pepper. Heat a sauté pan over medium high heat and coat with safflower oil. Once the oil is hot, add the salmon skin-side down. Let cook for a few minutes until the skin is crispy and the salmon easily releases from the pan. Flip the salmon and finish cooking on the other side until your desired doneness. 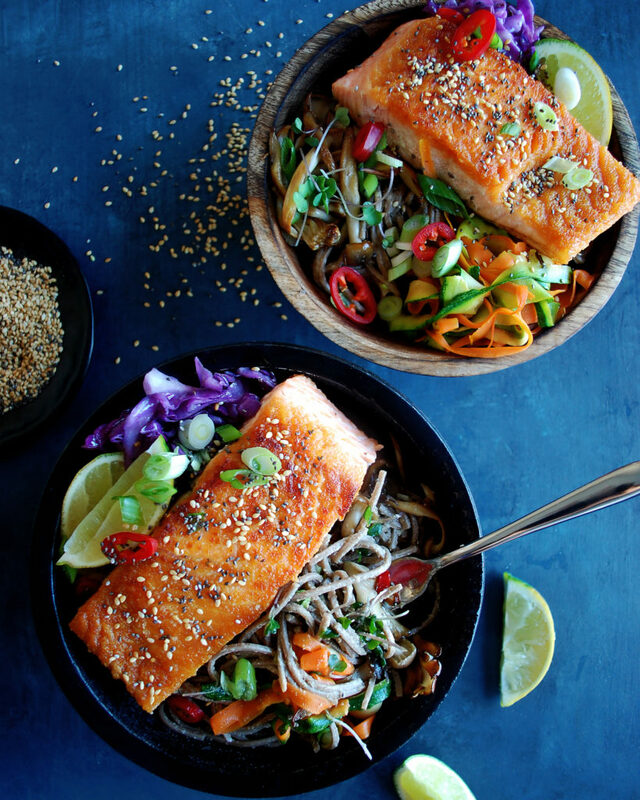 Serve the noodles in a bowl with the salmon on top. 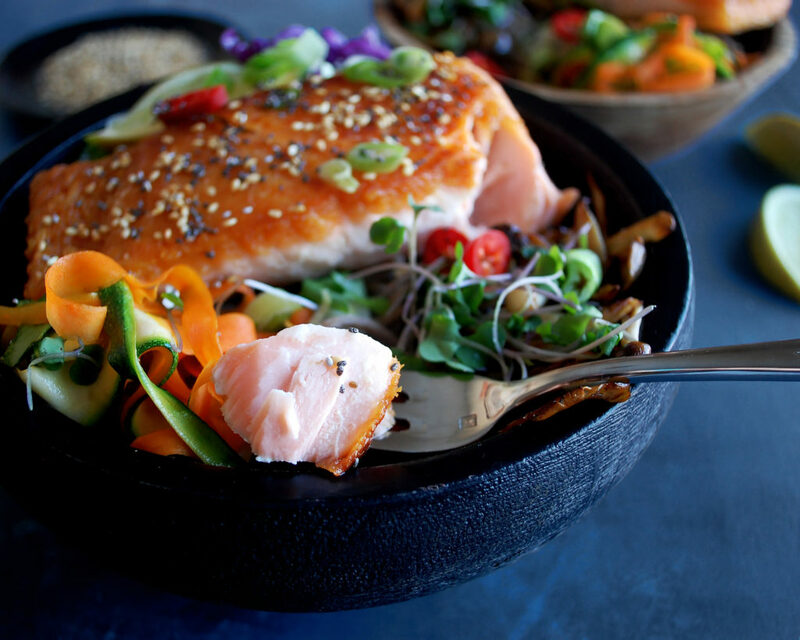 Arrange the vegetables around the salmon. Garnish with the green onions, red chili peppers, toasted sesame seeds, chia seeds, and lime wedges. So fresh and beautiful. Can’t wait to make these. Thanks so much! 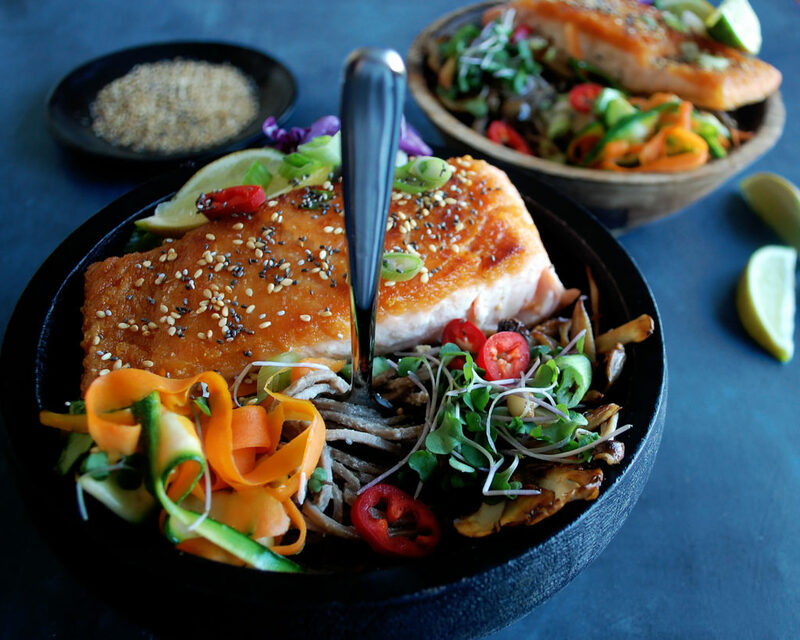 I love making bowls like this for quick meals…it just packs everything into one dish. Enjoy!